In this investigation, students simulate how mark and recapture techniques are used to estimate population size. 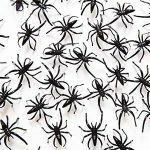 Prepare populations in advance by gathering 60-150 small objects, like toy spiders, beans, or beads. Toy animals seem to be more exciting for students, and you can sometimes find them at dollar stores. In my class, I have multiple different populations containing items so that each pair gets a different set and has a different population size. The worksheet walks students through the process of gathering 10 “animals” and marking them with masking tape, then returning them to the population bag. Students then randomly “capture” a group from the bag using a spoon, or scoop, or hands and count the number that have the mark. A formula is included for using the data to estimate the size of their population. I keep the population sizes written on a card so that students can check their numbers with the actual number. 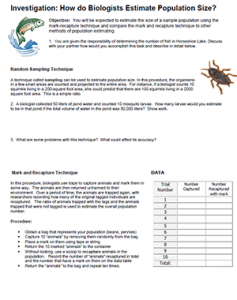 Investigation also includes sample data so that students can practice the formula and asks students to propose reasons why the mark and recapture technique might not provide accurate results. This activity works well with a basic unit on ecology.